I'm proposing this mostly for fun/learning. We spent a lot of time optimizing our diffing algorithm in Objective-C++ (e.g. custom unordered_map, tables, structs). It's blazing fast, but I'm really curious how it would perform in Swift. My hunch is that the current implementation will be faster, but I'd love to be proven wrong! @AndrewSB all the diffing is actually independent of the rest of the framework, just bundled w/ it so we aren't managing 2 projects where one (IGListKit) depends on the other (diffing). In fact, they used to be separate projects internally! We're tracking making a sub-podspec in #53 as well. Should be pretty easy. I like the idea about switching the algos on the fly though! Would be pretty cool. Oh you can find the original algorithm paper here. I'm going to take a shot at the implementation in Swift over the next couple days - will be at https://github.com/AndrewSB/Diff. @AndrewSB amazing. I'll keep an eye on it, and if you run into issues or have questions, ping me on an issue there (or here). Happy to help out! Using objc_msgsend / inheriting from NSObject means using the ObjC runtime. 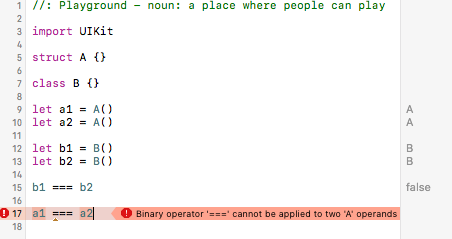 In this case, Swift is just "Objective-C with a new syntax". I wouldn't expect to see many differences. If you use the Swift stdlib, then you're kind of just measuring that against C++ STL, right? Do you mean static vs dynamic dispatch? In this case, if everything is protocol P, you'll still end up with dynamic dispatch. However, using constrained generics (<T: MyProtocol>) should give you static dispatch. Note that -Ofast will remove all safety (overflow-checking, etc.) from Swift. This is only recommended for hot, well-tested code paths. I would bet that this has a chance of out-perfoming the ObjC++ version. I was more talking about using a protocol that called Objective-C methods on NSObject subclasses (resulting in objc_msgSend(...)) vs just calling Swift functions on a Swift-only protocol. So ya I think static dispatch is what I was after. I've implemented a pretty naive version of Paul Heckel's algorithm in Diff.playground. There are a number of speed ups I know of already, but I wanted to get the algorithm outputting Edits before I started making it more complex. I went for the talk of Ryan in Singapore (great talk btw) and tried porting it to Swift. It was quite fun and I think I got an identical implementation. I passed most of the relevant unit tests which are also ported. This is done is Swift 3 and depends only on Foundation. Its in a single file so you guys can just copy into your project. Let me know if you find any bug. Thanks for the reference implementation. It very interesting and I learnt quite a bit. Equality check is not implemented yet because I haven't figure out the API interface. @lxcid can you do === for pointer comparison then == for equality? Just means diffed items have to conform to Equatable. Algorithm looks good tho! Funny how it looks basically the same considering its C++ and Swift. Was surprise to see that the === operator only work with class though, which make it tricky now. A workaround is to drop support for pointerPersonality check but introduce a custom enum that has the type pass through using generics, than one of the case take a closure which the user can implement pointerPersonality check. Something like this. Then structs are always just value comparisons. Ahhh didn't thought about that. I agree! @rnystrom did you end up testing the swift version? Was it any faster?